Monarchs and Monsanto - a plea to think (and grow more milkweed and eat more insects). The last few years has seen discussion of a rather worrying trend in declining numbers of monarch butterflies. One fairly obvious reason for the decline would appear to be a decline in the milkweeds (Asclepias species) on which they feed. This is because farmers are now so efficient at eliminating all weeds from their fields. Cue a hysterical reaction. Like this. I have long thought that environmentalists are often bad for the environment and this is a good example. The complete failure to think through some basics on this issue is spectacular. As is the refusal to take responsibility for one's own eating habits. Why take responsibility when you can blame an easy scapegoat. Like Monsanto. Just mention the company and you get an instant knee-jerk reaction – with an associated brain disconnect. Blaming Monsanto avoids actually looking at the issue.Which is what I intend to do here. Furthermore, the easiest solution to this problem is so obvious its ridiculous, and it is something which directly involves gardeners and the landscape industry. 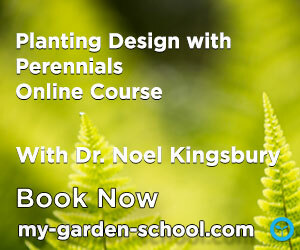 As anyone who grows their own veg can tell you, weeds compete with your crops and you have to minimise them. Farmers have to do this to survive commercially, something organic growers know as well as conventional. So can we blame farmers for using an effective herbicide like Roundup? Or combining the herbicide with crops which are genetically modified to resist the chemical? And why do the farmers of the Midwest grow so intensively? Or indeed any farmers? Well there are rather a lot of us. And as living standards rise, which they are rather doing strongly in many poorer countries, one of the first things people do is eat more meat. Meat production is an inefficient converter of plant material to animal: chickens aren't too bad, pigs and sheep are not so good, but beef cattle are terrible. In other words, farming needs to be intensive to provide us with the diet we have chosen. If you eat meat every day, it's no good blaming Monsanto for selling Roundup and Rounup-Ready crops, you should take responsibility for the disappearing milkweed. And don't say that you only eat local grass-fed beef, or some other politically correct feel-good foodie excuse. Do you suppose that organic beef farmers let toxic milkweed grow all over their fields? An alternative sounds attractive. Less intensive farming, wildflower strips, higher weed populations. Yes, all well and good. Except that the demand for crops is still there, and they have to come from somewhere. Reducing intensity leads to a trade-off effect – a need for more arable land. And that is one thing we don't have much of left. Arable land is actually declining globally. We also do not want to sacrifice any more wild landscapes, forests, wetlands etc. We simply have to get the most out of what arable land we have. I have driven around Iowa a bit (whilst researching at Ames Uni. and attending the World Food Prize, some years ago) - it is the quintessential Midwest farming state, and one where monarch butterfly populations and milkweed have notably fallen. And do I remember roadside to roadside crops? Every patch of ground covered in soya or corn? Er no actually. I seem to recall that like much of the rest of the USA there is an awful lot of mown grass. Vast areas of the stuff in fact. Alongside roads, around houses, offices, churches, shops there seems to be endless acres of this utterly useless vegetation. You can't eat it, cows can't eat it, wildlife can't live on it, and it needs mowing all the time. Why not plant wildflowers, include lots of milkweed of course. Problem solved. There is space for milkweed AND crops. On a slight change of subject, we would all live more lightly on the earth if we ate not just less meat, but er.... more insects. They are fantastically efficient converters of plant to animal protein. In Mexico last week I tried chapulines – grasshoppers, and even brought some back with me. Delicious AND sustainable!!! You may recall a piece I wrote about the philosophical aspects of polyanthus/primulas some time ago. Anyway, I have tracked down the source of the plants, which are now increasing in ever varied variety. You can read about them here in The Daily Telegraph. An interesting bit of plant breeding. I love that title the Telegraph gave the piece "polychrome-princess-of-the-petrol-pump". 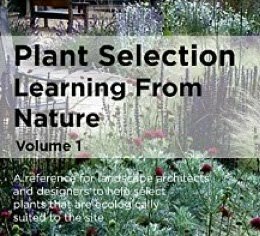 If you want to know more about the plants, here is the producer website, but please note, they are not retailers and are unable to supply anyone other than professional growers, nor are they able to advise on suppliers - you just gotta shop around the garden centres. A walk in the (Mexican) woods. Mexico has incredible biodiversity, with the state of Oaxaca having 60% of the country's higher plant species - some 6,500, that's four times the plant biodiversity of Britain. And its safe and very well organised for trekking. An Eryngium - a classic Mexican genus - their biodiversity starts to get good here and carries on right down to Argentina. We went with Tierraventura, a long-established eco-tourism company in the region, the pueblos mancomunados which is a unique co-operation between 8 indigenous (Zapotec) villages to promote rural development and eco-tourism. Latuvi, where we stayed overnight. Isolated but clearly going places. Mexico's indigenous people are finally catching up. Their strong sense of community self-help counts for a lot, indeed there is a lot going on here which the rest of us could learn from. Many of the social problems which plague other parts of the country seem absent. 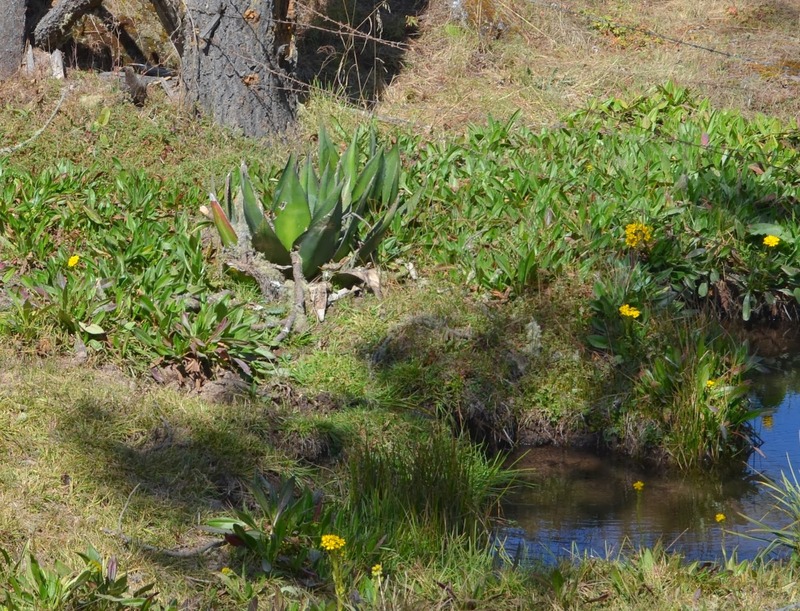 Agaves are very much part of the landscape and used for a kind of crude hedging along roads. They don't need dry conditions, sneaking up to the water when they can! With mostly acidic ingneous rock, Arbutus, i.e. madrone with amazing peeling bark is a minor tree element amidst pine and further down, various oaks. Arctostaphylos, i.e. manzanita species also very common, reminding me of trekking in California. Doesn't this remind you of Deep South longleaf pine and wiregrass? According to our guides it is not a fire-mediated plant community however. The interesting news is that all this young pine is re-afforestation as the area used to be used for potato growing. Gentians! Just like Switzerland, but much paler. Later we found another gentian species. Is that a bullet hole in the sign? Saw a lot of this little alchemilla. I never realised that the genus exists in the New World. Epiphytes are what make this trip. Huge numbers especially on west facing tops of slopes or escarpments where humid air is forced up. A Tillandsia species, sitting on a twig like birds on a cable. Distribution varies, some species dominate in some locations, but then are replaced by others a few kms further on. Surely one of the strangest and most specialised of flowering plants, Spanish moss is neither Spanish nor a moss so lets stick to calling it Tillandsia usneoides. Cordyline/Dracaena/Yucca relatives, not sure of identity look surreal in woodland, as do agaves, but that is how they grow. I am reminded of Philip Brown's planting of cordyline and phormium in native woodland at Portmeirion in North Wales. We tend not to think of these as woodland plants but why not? Some orchids, ID? on damp rock, later we saw some on trees, mostly older trees. Always intriguing to see which plant families dominate an unfamiliar area. Mexico is famous for Salvia - we saw quite a few but this was the dry season so they were not very prominent. Also many and this is true of a lot of shrubs here are messy gappy plants in the wild, often in shade (the sun is very strong) and do not make much impact. A lot of shrubby Asteraceae, which we are not familiar with at all, Many would make good plants for horticulture in areas which get only light frosts. Interesting to see shrubby species of general familiar as herbaceous in North America, like this gorgeous Vernonia, from which i did get seed :) . It fades to white from mauve. 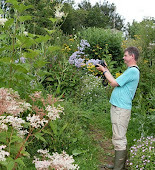 Lots of shrubby Ageratina (a group of formerly Eupatorium). this one was out in the sun and had lost its leaves but it made a great impact and a reminder that in the right place they can form nicely shaped shrubs. We have A. ligustrinum in cultivation in milder parts of Britain, but there are others here. Would be good for autumn flower. Notice the warm shirt, as it starts off jolly cold at 3000m +. Finally the cacti, of which we saw a lot on rock outcrops on the last part of our two day trek, the most uphill and hottest part, often on rock outcrops and sometimes in company with ferns - the fern flora here has many species which die right back in the dry season. A wonderfully colourful Tillandsia species. A holiday in Mexico, driven from England by the endless rain. Can't really afford it, but essential for our sanity! I've been twice before, but in a work capacity. So, nice to explore an extraordinarily colourful and vibrant country, with immense cultural richness - although if you keep up with the news you realise also that this is a deeply troubled country too. It has fantastic biodiversity, which needless to say, faces all sorts of threats, although opinion polls show Mexicans to be very supportive of conservation and environmental policies. 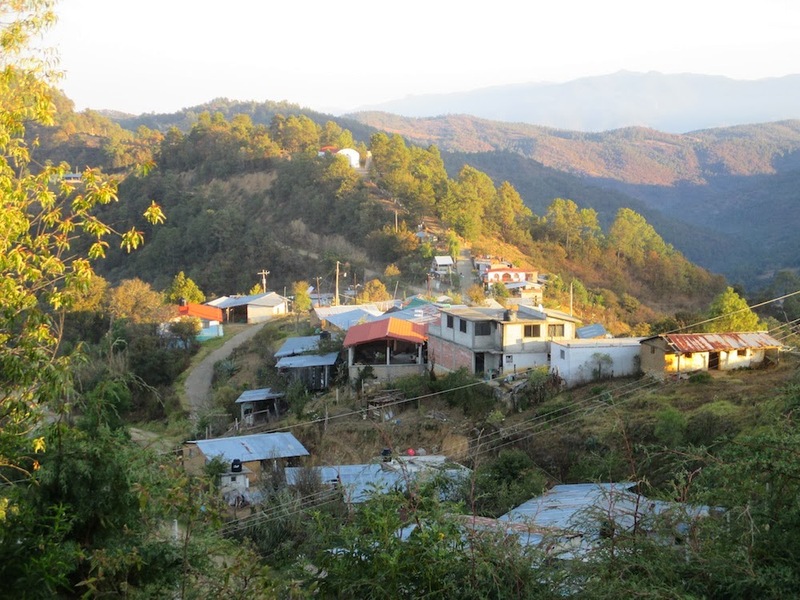 In Chiapas, the main problem is poor farmers, driven mostly by population increase, clearing forest to farm, although a lot of the land is very steep. A problem exacerbated by the social divisions created by fundamentalist christians (missionaries funded by US churches who turn people, especially kids against their native culture), who then go off and form their own separate communities, which need yet more land. Trees are felled and the orchids, ferns and bromeliads that make up the very rich epiphyte communities in the branches are burned. After having seen the damage caused by the development of one such village, an American living in Mexico, Craig Dietz, known as 'Cisco' rescued a load of plants and set up a plant rescue mission. 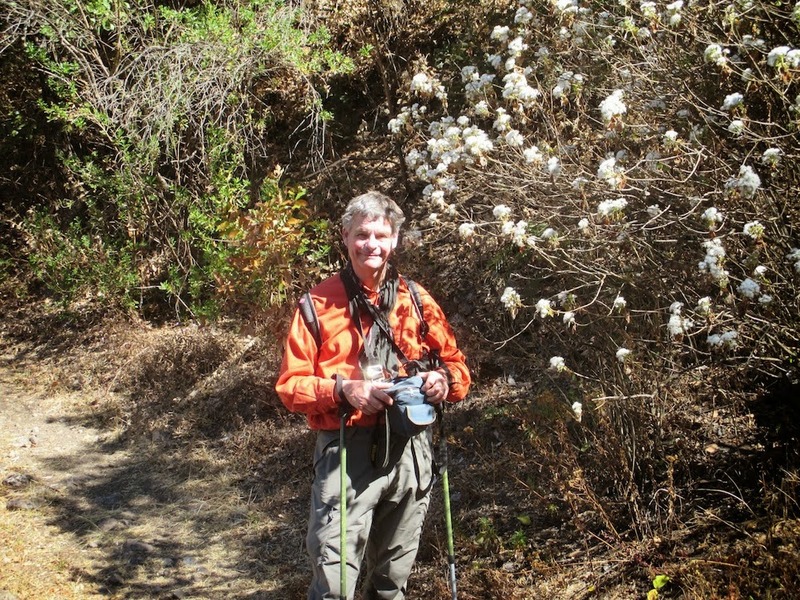 His work, all over Chiapas state has provided a lot of useful data for the academic botanists who rarely get out. Local environmental organisations have linked with him - his 'Orquidario Moxviquil' - essentially a privately run botanic garden, is a great focus for their work and publicising what they do. One of the spectacular tillandsias whose flower spike takes two years to grow, and suffers from being very popular for church and shrine decoration - creation threatened by religion! One of the things Cisco does is to encourage people in the villages to do their own plant rescue and grow epiphytes themselves. Cisco, with Jo. He is one of those amazing guys, an old California hippy of course, who is just doing such important work, and seemingly achieving a lot, that makes the rest of us feel inadequate. There are some wonderful whacky structures around the place, such as an amphitheatre for school parties and a greenhouse for the plants from lower down in Chiapas that cannot take the minus 3 temperatures which you can get in San Cristobal de las Casas. He's now got funding from the Mexican government for a massive new house for lower altitude plants too. And Cisco was adamant that i had to photograph the rubbish bins. This is an incredible place, and a very good model for other regions. The world needs more Ciscos!